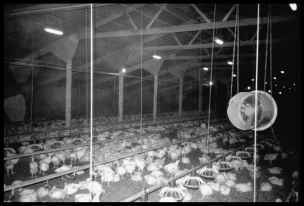 Broilers are typically housed on litter-covered floors in buildings holding groups of tens of thousands of birds (Fig. 2). They generally have sufficient room to move (at least when they are younger) and can perform many of their normal behaviors, so behavioral restriction is not as much of a concern as it is for laying hens. However, like turkeys, broilers have been selected and are managed for rapid growth, growing to full body weight in a mere 6 weeks. As a consequence, they share many of the same health problems as turkeys. 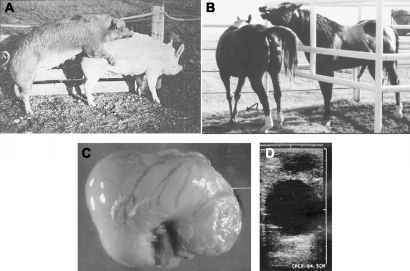 These are described elsewhere in this encyclopedia and will not be discussed in detail here, but they include skeletal disorders that can lead to lameness, footpad and hock lesions, and eye and cardiovascular problems. The incidence and the severity of these disorders vary from one flock to another and are influenced by many factors, including genetics, lighting and feeding programs, ventilation, quality of litter management, and housing density (crowding). Other potential housing and management problems are poor air quality (especially high ammonia levels, which can cause eye, foot, and respiratory problems), infectious disease, and death losses due to heat stress. There is increasing emphasis on the adoption of on-farm monitoring and management practices to decrease these prob-lems. A related issue concerns the management of the parent flocks of broiler chickens. Unlike turkeys, chickens are still produced by natural mating. However, since broiler strains have been selected for such fast growth, the parent birds become obese unless their daily allowance of feed is strictly controlled. Like molting, this causes hunger and can lead to the development of abnormal behaviors. Fig. 2 Broiler chickens typically are housed in large buildings holding thousands of birds, but with more freedom of movement and fewer behavioral problems than laying hens. annually worldwide. The primary cause of transport mortality is heat stress, although factors such as trauma due to rough handling are also important. There are catching machines that cause less stress and injury to the birds than human handling, and while these are routinely used in a few countries, technical problems have slowed industry-wide adoption. Improved transport vehicles that allow closer control of temperature and humidity are also available, and these can significantly decrease bird mortality due to thermal stress. When the birds arrive at the processing plant, they are typically dumped from the crates, hung upside-down on shackles, and then stunned electrically prior to having their throats cut. Because electrical stunning is not always effective in producing unconsciousness, gas or modified-atmosphere stunning (e.g., using carbon dioxide mixtures, argon, or nitrogen), which more reliably renders the birds unconscious, is now being recommended as an alterna-tive. [2,4] A particular welfare advantage of gas stunning is that the birds can be stunned in the crates, which eliminates the need for conscious birds to be handled and shackled.